Oscar never changed, but his prey selection did. When he went from eating animals no one liked anyway to animals we owed cosmic reparations, it was a game changer. 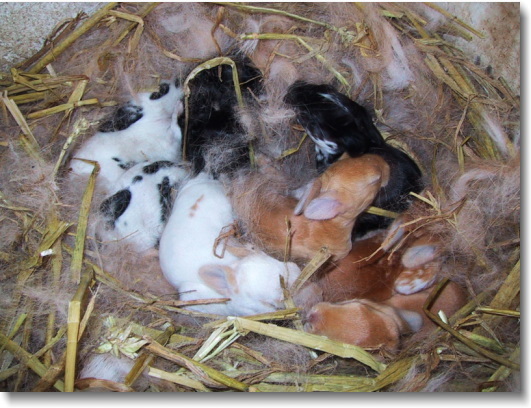 A nest of baby rabbits appeared in the hollowed edge of a tree about 40 feet from the patio. Somehow they managed to live long enough to open their eyes and develop fur, though how Oscar ignored them that long is a mystery. He may have had more than enough to eat closer to the patio, and was just too lazy to slither over to the tree. The mother rabbit stayed close to her babies, and we could see her come and go from her nest. Oscar could see her come and go, too, and one day when she went, he made his move. My mother saw this and swooped into motion as she had flown to the hutch before. The plan? There was only a goal. Get Oscar away from the babies. She grabbed a rake and snared him across the tines. From the house I could see only a wild woman with a long, surprised reptile on the end of a pole. The snake thrashed like a thick black stocking in gale force winds but my mother was undeterred. She ran with him to the edge of the woods, pulled the rake back over her shoulder and pitched Oscar with all her might over the hill toward the creek. The obvious and naïve belief was that one can just throw a snake away. We all wanted it to be true, so we believed it. Of course, there are fewer creatures more tenacious than a snake; even the mild-mannered do not leave a place where all of their needs are met and life is good. Oscar was back almost immediately, and so began a daily dance between my mother and the black snake. What awed me most was my mother’s commitment not to kill him. She valued that snake, but he had crossed a line that she would hold, no matter how many times she had to take the fight to him. Those baby rabbits would be saved, and Oscar could go easy or he could go hard. But Oscar did not give up, and my mother eventually accepted that saving the rabbits meant they had to get out of the tree. Wearing gloves, she took the babies and put them in a box, then carried them into the house. I remember seeing their little eyes shining like ebony beads as my mother held each one in a gloved hand and fed it some kind of milk or formula from a doll’s baby bottle. Their fur was brown, with smaller flecks of black hair. Their ears were tiny, and their little claws scratched the plastic bottle every now and then, making a soft but perceptible sound as they reached for nurture in a safe place. Memories of childhood events are slippery. A child’s mind often clings to and obsesses on images and events that imprinted an emotion more than they imprinted a detailed fact. Sometimes we delete entire events or rub to blur the details of exactly how something resolved. I do not remember if my mother eventually had Oscar killed, though I am confident if he was terminated she did not do it herself. I do not know what happened to the baby rabbits once they left our bathtub, though I seem to have a memory of their restoration to the natural world. I do not know what happened to Lee or to the hutch, but I know the reasons why I do not make any effort to discover the definite answers to these questions. The first is that after all this time, I believe any pieces of the puzzle that anyone else has are doubtless as worn by memory loss as are my pieces. There is a degree to which I am not even sure I have these two rabbit stories in the correct order; but I want to ignore that possibility, because even if they are not in the correct order, they are in the right order. The right order is the way we tell our life stories so that they make sense. Human beings often look to life and death in the natural world to sketch out and then paint in our most complex and unresolved stories. What is right? What is wrong? Is listening to fear a healthy way to navigate life? Are there any answers that could ever cover all of our conflicts so that we might know, with certainty, how to live in peace and harmony with the lives around us? The human narrative tells us we are one with the world but also separate. There is something about mankind that keeps us unable to function seamlessly with the rest of God’s creation. We are forever trying to get back to the garden, but when we get there we still do not seem to know how to fit in. It’s as if we can’t stop trying to fix something all the time, but those efforts only lead to more to fix. We can remember, though, that we tried. And we can tell our stories until our lives make sense. the snake on those tines and your mother ran downhill through fall leaves.